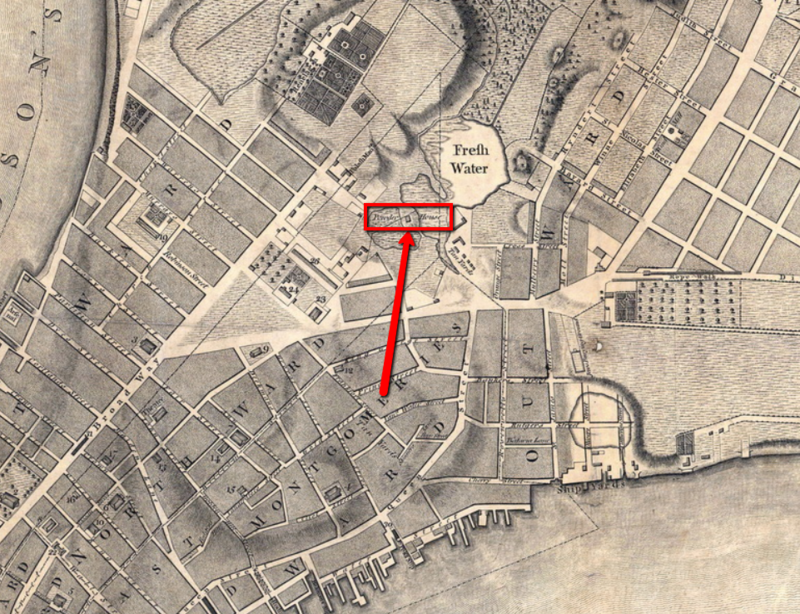 Beginning on this May 11th, and scattered depressingly over the coming weeks, we revisit New York City’s great terrorist panic … of 1741. 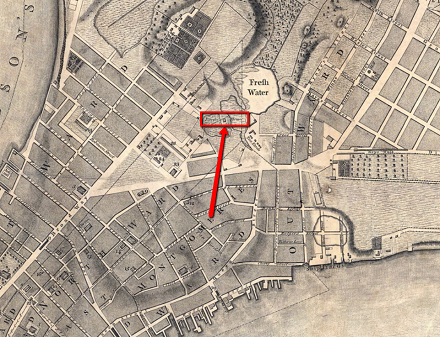 This was scarcely the first security scare of New York — indeed, the city had been rocked by a major slave revolt back in 1712, a revolt that included arson. By 1741, New York “boasted” the second-largest slave population of Britain’s North American colonies, behind only Charleston: enough souls to outnumber the city’s propertied elite should they manage to act in concert. As the cruel winter of 1741 abated, a series of fires in the city raised suspicion … and then fear … and soon, certainty … that just such a slave conspiracy was underway. On March 18, Fort George caught fire, burning to the ground with the mansion of the autocratic royal governor before a semi-timely rainstorm aborted a potential Great Fire of London scenario. Nobody could be sure what happened, but the cold-dried tinders of a wooden city were easy prey to accidental sparks. Though devastating, the calamity was not necessarily suspicious. The event took on a different hue when another fire broke out near the ruins of the fort the very next week, March 25. Another occurred on April 1, and yet another on April 4. 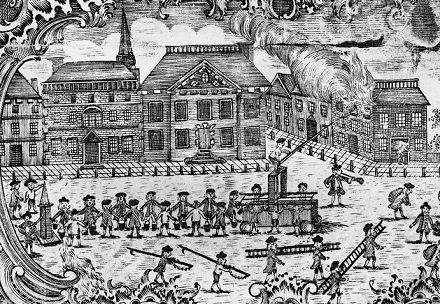 1762 illustration of New Yorkers fighting a blaze by passing water buckets to a pumping wagon. A frightened populace confronting a shadowy menace in a world at war made an environment ripe for a witch hunt. That was not quite true in the literal sense:* a half-century’s distance from the Salem trials put 1741 New Yorkers in a different philosophical universe. But for at least 30 of New York’s slaves, and for four white people known to keep intimacy with them, the effect was much the same. Harrowed between the masters’ self-confirming fears and their fellows’ desperate accusations under duress, the plot or the “plot” staked them to flaming pyres, high gallows, and public infamy. We will pause for the particulars of various individuals’ situations as we meet them. As to the general outline, the provincial supreme court that condemned these 30-plus souls (and inflicted various sub-lethal punishments on others) had via testimony delivered to a grand jury beginning on April 22 evolved a working theory that the black slaves who frequented a tavern kept by a white couple named John and Peggy Hughson had formed a sinister society bent on outright revolution. The allegations of the Hughsons’ servant Mary Burton, drawn from her with fear and favor, were key to the entire affair; in her words, three slaves named Caesar, Prince, and Cuffee were the architects of the plan along with Mr. Hughson and they aimed to “burn the whole town … [and] when all this was done, Caesar should be governor, and Hughson, her master, should be king.” More than that: these dark serviles should when they ruled New York have the city’s white women for their own. There is something of the Witches’ Sabbath about these specifications after all. Whether there ever was a slave conspiracy — and if so, whether it ever compassed more than a handful of people, or rose past the level of loose words or isolated and opportunistic deeds — has never really been known. Cities have now and very much had then a susceptibility to fire, and their inhabitants a susceptibility to finding spurious patterns in noisy data. 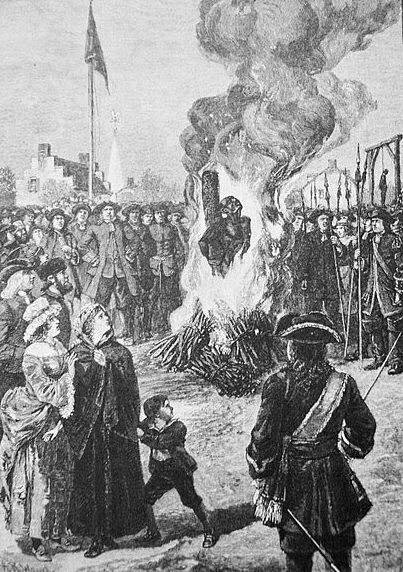 As soon as July of that same year 1741 it was charged publicly (albeit anonymously) that those tongues of Hell had been the “merciless Flames of an Imaginary Plot,” and New Yorkers admonished that “making Bonfires of the Negros … [is] perhaps thereby loading yourselves with greater Guilt than theirs.” On the other hand — and one is reminded here of the Rorschach quality these distant and ill-documented episodes carry — the idea of an actual wide-ranging slave plot has also been valorized as working class resistance to the cruel Atlantic economy. To think, the ghost of Spartacus abroad in Manhattan! If it were, then they died like Spartacuses, too. * Witches were actually passingly entertained as the possible malefactors here, as the day for this superstition was not yet entirely past.